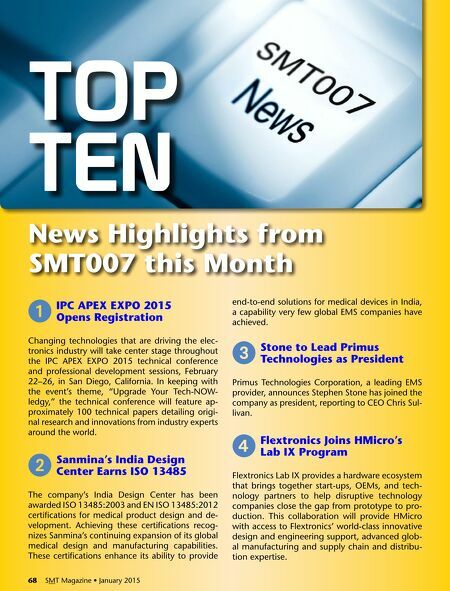 January 2015 • SMT Magazine 69 5 Sunburst now IPC Trusted Source, QML Listed ipC's Validation Services program has awarded an ipC J-STD-001 and ipC-A-610 Qualified Manufac- turers listing to Sunburst electronics. The com- pany met or exceeded the requirements for the electronics industry's most rigorous classification, class 3, which is intended for high-performance electronics assemblies. as a result, the firm is now listed as an IPc-trusted source capable of manufac- turing in accordance with industry best practices. 6 Sanmina receives Quality award from nokia Sanmina Corporation announces Nokia Networks, the world's specialist in mobile broadband, re- cently recognized Sanmina for outstanding quality with a 2014 Quality Award for Supplier excellence. 7 Hunter Technology Secures $8 Million in financing Bridge capital Holding, whose subsidiary is Bridge Bank, has provided Hunter Technology, a leading provider of electronic design and manufacturing services for defense/aerospace, networking/tele- com, and medical customers, with $8 million in fi- nancing in the form of a line of credit and an equip- ment guidance line to purchase new manufactur- ing equipment and support working capital needs. 8 IEC Electronics reports revenue of $35.7M in Q4 W. Barry gilbert, chairman of the Board and cEo, stated, "This quarter's sales results improved on a number of fronts. our revenue increased com- pared to the third quarter and we expect solid growth through fiscal 2015. Furthermore, we re- duced our debt by more than $5 million and in- creased our backlog by more than 20%." 9 Cephasonics Selects Piranha as EMS Partner piranha eMS inc. has been chosen by Cephason- ics, a technology leader with a game-changing embedded-ultrasound platform, as its eMS part- ner for the company's newly introduced cQuB-1 (cQuest ultrasound box-1). J PartnerTech Expands MedTech Business PartnerTech has signed a new, significant frame- work agreement with a leading global medical technology company, expanding the cooperation to cover manufacturing and distribution of the company's products globally. 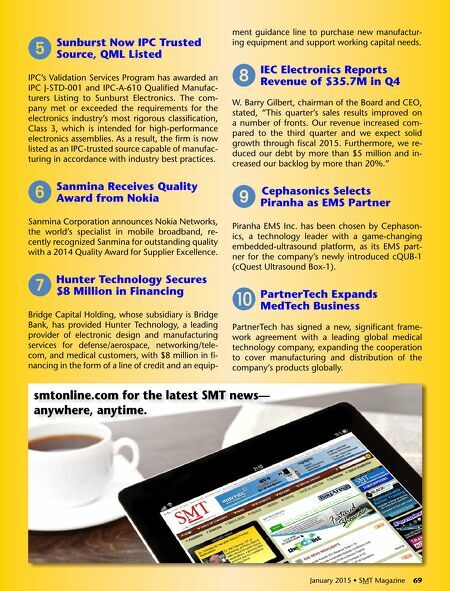 January 2015 • SMT Magazine 69 smtonline.com for the latest SMT news— anywhere, anytime.